The state’s top accountant said the MTA’s finances are at risk of going off the rails. A review of the Metropolitan Transportation Authority’s books by state Controller Tom DiNapoli noted upcoming budget deficits over $1 billion, a planned fare hike and a credit downgrade that could make borrowing more expensive. His report doubted the MTA’s ability to handle the work proposed under its Fast Forward Plan, its marquee blueprint from NYC Transit President Andy Byford to make the subway reliable. The Daily News reported Wednesday that the budget crunch forced NYC Transit’s Department of Subways to order an overtime freeze this month through March 31, unless it's repair work through the $836 million Subway Action Plan. In anticipation of the belt tightening, NYC Transit is chopping $123 million next year, through cuts to subway car cleaning and night staff, 12 subway booths, maintenance schedules on certain buses, overnight bus service to the Staten Island Ferry down to once an hour, manual track inspections cut to once a week on a third of the subway system, and deferring Select Bus Service routes until 2021. DiNapoli pinned the budget gaps on the falling subway ridership, rising cost of health insurance for MTA employees and retirees, more borrowing for capital repair and construction projects. Gov. 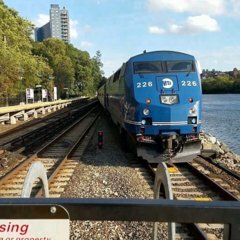 Cuomo wants the city and state to fund the MTA’s next capital budget, plus a congestion pricing plan that charges motorists to enter Manhattan. Mayor de Blasio has opposed pumping city money into the plan and has called for a tax on high-earning New Yorkers. The last time they fought over transit funding, projects were delayed, the report noted. The task is greater now, with NYC Transit chief Andy Byford’s Fast Forward plan in need of funding. It could be as high as $40 million over 10 years. Nonetheless, "whether the MTA can successfully manage” even a five-year plan of that size “remains to be seen,” the report said. The Riders Alliance, a grassroots advocacy group, said the report makes clear the MTA needs more money. "Drivers can afford to pay more to keep transit functioning for millions of daily riders,” Riders Alliance spokesman Danny Pearlstein said. “Congestion pricing is a fair funding option that would go a long way toward restoring reliable commutes, increasing capacity on our trains, and making the subway accessible to all New Yorkers." So can I... By law, they have to balance their budget one way or another... People need to remember that. That's one reason I'm not so sure that this redesign was poorly planned by coincidence on Staten Island. You provide good service, you draw more ridership, and after a while running an express bus every few minutes becomes quite expensive. If you run crappy service, you piss some people off enough to get them not to ride, and then if enough of them don't ride, you can cut service, thus saving you money, and while it may seem absurd, if you cut a few trips, that can save a million here and a million there. Every little bit adds up. IMO, if the cut the ferry buses to once an hour over night, they should tell people on the ferry schedule, which buses are connecting. You don't wanna get to St. George and realize that you have 30+ minutes until your connection comes. They should have buses match every ferry. With buses connect every other ferry, if you don't catch the right ferry, you're be forced to pay for a cab if you want to get home as quickly as possible. They already cut back the buses that they originally added late at night citing low ridership. I still see the buses running on 30 minute headways overnight. Yeah, but they cut something. What specifically escapes me at the moment. Not yet. They eventually will cut the overnight service to hourly on all routes. They cut S78 Bricktown Mall bound service Service Saturday Mornings from every 30 mins to every 45-60 mins. de ja vu all over again.. Back to the 2010 cuts and then some more..
Just when you think they would have their act together... SMDH. Fat chance... Their costs will only continue to go up. That's why they're going to need a dedicated cash source long-term. I think we may see congestion pricing at some point. Simply too many cars on the roads. I agree and plus with the having a bad grade already.. Bonds are out of the question. The cuts were noted in the July Financial Plan, which is crucially a budget proposal. The final plan doesn't go into effect until November -- that's why people refer to the budget as the "November Plan." Service cuts are a very temporary solution to a structural problem. As long as the MTA continues to rely on borrowing/PAYGO/weird pension games to fund things, you can count on a real scale financial crisis taking place. There needs to be a drawdown of debt and a complete examination of both funding mechanisms and of the spending itself -- I daresay there are many wasteful practices on the expenditure side. Well they are technically broke. That is true. The problem is they've been borrowing for so long that going forward they'll be paying more to borrow, thus putting them further in a hole and forcing them to either keep jacking up the fares and tolls and take even more aggressive measures to balance their budget. I would compare it to someone who has bad credit... You pay more and more to borrow money, thus putting more financial strain on yourself. Service cuts are a very temporary solution to a structural problem. As long as the MTA continues to rely on borrowing/PAYGO/weird pension games to fund things, you can count on a real scale financial cris﻿is t﻿aking pl﻿﻿﻿ace. There needs to be a drawdown of debt and a complete examination of both funding mechanisms and of the spending itself -- I daresay there are many wasteful practices on the expenditure side. They seem to have so many damn presidents that I can't keep up. Some President was on the news today and I was thinking who in the hell is this guy who I'm sure earns well over $200,000 a year? Just way too bloated. Instead of cutting the salaries of these guys, they'd rather cut service, cut back on cleaning and cut back on the basics. I know what their argument is and it's partially true. If we want talented management, we have to compensate them for it and I'd say that's true, but Jesus Christ. How many presidents do you need? Exactly. The phrases "analysis paralysis" and "managerial blubber" are terms these folks need to get acquainted with. IIRC, off peak ridership started surging the moment they introduced the unlimited Metrocards, because people didn't have to budget for all their rides anymore. You're pointing out when it started (you're right with that btw)..... However, I'm (and I assume Qm1to6th is also) more talking about much more current/recent trends... Surely you don't believe that off peak ridership in today's time, remotely resembles that of around the time the Unlimited's came out? What they should at least do is coordinate it so for example, for one boat, you have an S40 & S48, and for the other boat, you have an S46 (And maybe the same with the S51, S74, and S78). So at least those willing to walk further can do so without waiting the full half hour. Maybe some of those double buses that used to meet some of the ferries (which to be fair, date back to a time when they were necessary because the ferry ran once an hour and dumped crowds of people onto the buses). It definitely wasn't the half-hourly overnight service. The North shore might work. But people in areas like Rossville and Arden Heights which has nothing but the S74 overnight, same goes with some parts of Victory Blvd with the S62 and parts of the S78. Is the SIR still going to run every 30 minutes overnight? Still better than nothing. At least some people get service. And yeah, that's a good question, because given the low ridership of the SIR (does it run 2 cars overnight or 4?) it seems weird they would keep that and cut the buses. Mabye a good idea is to use some of the buses that they cut and have the S59 run hourly overnight. 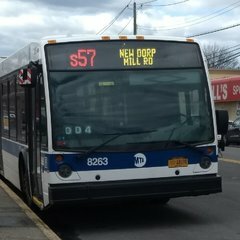 It would only require 3 more buses in each direction (6 trips total) and they could remove the three Weekday and the one Saturday and Sunday early morning short turns from the SI Mall to Hylan Blvd to reduce the number of extra trips needed. So with this plan, 3 more Weekday trips and 5 more weekend trips would need to be added to the S59 in order to run 24/7 service on that route. I'm surprised how Richmond Ave, a major SI corridor is a transit desert late nights.